Triana Energy’s drilling process has been refined through years of experience with the goals of advanced engineering, quality production, cost-effectiveness, environmental stewardship, and safety in mind. The basic steps involved in the extraction and production process (noted below) often take several months to perform, but are only a temporary event in the overall life of a natural gas well that safely and quietly produces for decades. Oil and Gas Lease - Prospective properties for oil and gas production will be leased from the mineral owner by Triana Energy. The lease is a contract between Triana Energy and the mineral owner which grants Triana Energy the right to extract the minerals from the property, along with appropriate access to the surface to conduct its operations. The lease will contain the business terms agreed to by Triana Energy and the mineral owner, such as the length of the lease, royalty interest, annual or one-time rental, etc. Site Selection and Preparation – Once leased, your property may be identified as a site for the actual surface location of a pad from which several wells will be drilled. Extensive interaction between Triana Energy and the surface owner will be required to site facilities and roads. Extensive reviews are conducted to avoid and or minimize any potential NEPA impacts. Physical construction begins after all appropriate permits and approvals have been granted by the various governing bodies. Drilling the Well – Once the drilling location is constructed, the drilling rig and other equipment will be erected on site. Excavation is commonly required to build water staging areas or impoundments for water storage to be used during the completion process. 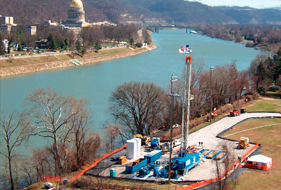 The drilling and completion process may take several months to perform, but is only a temporary event in the life of a natural gas well that produces for several decades. The process involves a variety of companies providing services to Triana Energy. The drilling operation is a continual 24 hr., round the clock process until the well reaches its target depth. At that point, the drilling rig will move off of the well and other equipment will be brought to the site to complete the process which involves injecting a mixture of primarily sand and water into the rock formation to release the gas held there. When gas production is established, Triana Energy will construct a pipeline to take gas from the location and deliver it to the market. Reclamation & Production - After all of the equipment is installed, the location is restored as nearly as possible to its original state. When the well is in production, a well tender will visit the well periodically to assure efficient operation. Occasionally, a truck will visit the location to collect any produced fluids for recycling or proper disposal if necessary.